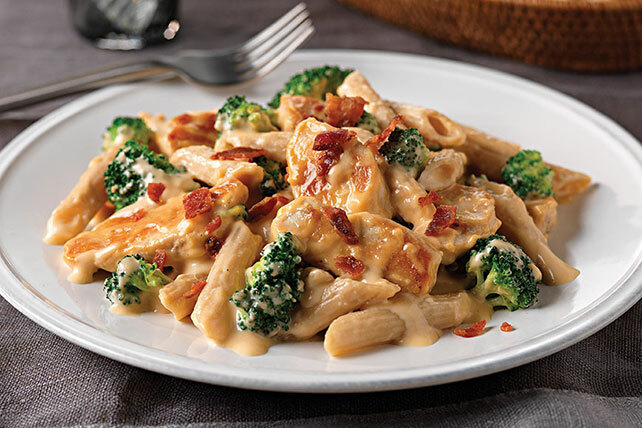 Chicken breast strips and penne pasta are tossed with cheesy broccoli in this easy skillet dish. Top with bacon crumbles and enjoy! Meanwhile, mix cream cheese spread, 2 Tbsp. milk and garlic powder until blended. Cook and stir chicken and onions in large nonstick skillet on medium heat 7 to 8 min. or until chicken is done. Add cream cheese mixture and remaining milk; cook and stir 2 min. or until heated through. Add cheddar; cook and stir 2 to 3 min. or until melted. Drain pasta. Add to chicken mixture; stir to evenly coat. Top with bacon. Serve with a crisp mixed green salad tossed with your favorite KRAFT Lite Dressing to round out the meal. Substitute your favorite frozen vegetables or vegetable blend for the broccoli.